Who would have thought that Dickens’s opening line for ‘A Tale of Two Cities’ written during the French Revolution would reverberate with such topical relevance so many centuries later. Today, a revolution of sorts is brewing on our home turf, with its epicentre in Delhi but with ramifications far exceeding its geographical boundary, or any boundary. While it digs its heels firmly into the ground to prop itself up fully, there continues a coexistence of hope and despair, wisdom and foolishness, belief and incredulity. You read that right! Hope, belief and wisdom have made a comeback in the political sphere. And you know why. The Aam Aadmi Party stands for change – an ideological one that has been brought about already when voters gave them 28 seats, and more that is to follow as they proceed on their promises. After ages, democracy is being spoken about in a language that befits the idea. The electorate is looking for direct participation in the running of our country. This, combined with the anti-corruption platform AAP offers, is what brought the hope back in our political lives. AAP emerges as our mouth piece, voicing our age-old concerns and issues and promising to deliver in the real world, rather than the world that (mal)functions behind closed doors marked VIP or that which refuses to go beyond futile rhetoric of election speeches. As grand and often unrealistic as the ideas of AAP sound, we sit today wondering, almost hoping – is this the beginning of a new way of functioning of politics, in a larger context and for all times to come? Terms which adorned books on administration are now being mouthed generously – governance, accountability and most importantly, citizen politics. And urban India is sitting at the edge of its chair, with an excited mind and of course, hope for clean and citizen-friendly governance. All this, even as it cheers a party free from any caste or class based propaganda. One which promises a crackdown on corruption across party lines, a Lokayukta with teeth and the dream of ‘swaraj’ in its modern concoction and after years of it being used for the first time. Indeed, this is the Season of Light. How, what and ‘Winter of Despair’, still? Incredulity breeds questions, and unanswered ones lead to cynicism. Cynicism equals the feeling that we have nothing before us. A feeling that the season of darkness is here to stay, and no amount of light can shine Hope’s way through. AAP and its ideologies continue to keep a school of thought a little distant from rejoicing just as yet. AAP’s agenda remains blanketed in confusion. Many feel that even as AAP promises clean governance, it offers nothing very concrete by way of an agenda for governance. Transparency is a way of working, not the work itself, the ‘how’ and not the ‘what’. Then, is it an easy promise to keep, that of a spotlessly clean shop? More so since cut-in-stone party ideals may not match well with every party member’s personal list of principles? What next, except rubbernecking media and powerful opposition parties swooping down on them the moment they smell a scam. The very expectations of aam junta which sat AAP on a pedestal will withdraw its hands. And we know that is something we do not want to consider as a possibility. Doubts also abound with another aspect of ‘how’ the party intends to function - AAP’s stress on consulting people to reach decisions and forward the idea of grass root democracy. The debate of Local level versus national level (Yes, the CM is a few days old and we are thinking of a bigger tomorrow already). While implementation of health and public order can be achieved at local levels, macro issues like inflation and national security cannot be handled at local levels. Sceptics say consulting people all the time hampers rather than facilitates governance. Referendum upon referendum may turn out to be a jog on the treadmill, good for keeping the democratic mood healthy, but sans any movement ahead. And then, the perpetuation of the culture of subsidies, as free water and subsidized power tariff please the common man but burden the exchequer for short-term benefit, has generated mixed responses. Calling privatization ‘just a grand theft with official collusion’ has not helped either. 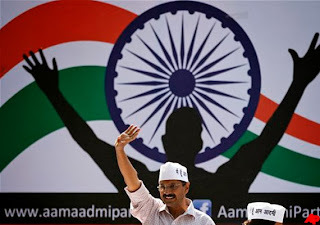 Some have gone as far as to compare Kejriwal with Mamata Bannerjee, foreseeing a Bengal of Delhi, with leaders who are pro-poor, simple and connected with people but impulsive, aggressive and limited in their knowledge of how the field works. Where direct intervention for solving people’s problems is given priority over sitting and chalking our systems to be put in place for all times to come, the revolution seems to carry the tendency to burn itself out, or be forgotten in oblivion. AAP with its 28 became a sea to reckon with, and if whispers and announcements are anything to go by, the bigger wave is yet to reach the shore of our political lives. Perhaps, to re-write that which has been documented in the colour of a dynastic quill, or one which stands clothed in saffron and not far behind. Blake said ‘without contraries there is no progress.’ Well, good to hope so, and certainly better to remember as we, on a daily basis, receive and perceive the changing face of Indian polity and assimilate our views in times where perceptions live as impulsively as they are born. The last winter of despair need not be forgotten completely. Doubts may continue to remain, and raise newer heads each passing day. But we need to accept that things are a changing. Smell the change in this spring of hope instead. AAP has shocked us all, even as it took its own members by surprise, by sweeping to power with a unique model that challenges the traditional party system. Something that we collectively wished for has come about, thanks to you and me. Yes, thanks to us. We asked for it written all over placards and in candle marches. We found a role for ourselves in protest mode, and then as voters. And it does not end there. It should not! Even as Kejriwal and AAP continue to awaken our dormant social forces, we need to wake up to our responsibilities too. Meaningful ways to bring about social change need to be found and healthy dialogues that break accepted but obsolete norms need to be regularly held. Even as we mail the CM our complaints and lay on AAP’s shoulders the responsibility to deliver all that we desire as part of our idea of ‘change’, we need to start working on it at our own levels too. We voted the broom in, time to clean our own houses too. Then and only then can parties like AAP stand on their own feet – confident and inspired enough to promise and deliver, both. Willing-to-Work Idealism has an official address today. Let’s not fritter it away! I thought the title would be RIGHT and WRONG. Let us wait until next election results to know the people recognized AAP's Identities and its Performance or not. You have rightly pointed out that there are many doubts about AAP's plans of action, etc., etc.. Yet, there is hope simply because AAP exudes SINCERITY and INTEGRITY, which are in short supply not only among the political class, but also, sadly, among us citizens. The AAP probably is too young and new to prove a point right away..And the fact remains that they have been fighting against the Indian Political powerhouses of Congress and BJP , which is a challenge in itself..Let's see.. While honesty of purpose is their strength, economics is their weakest link. As you say, not everything is wrong with politicians only, the society needs to look within too. Absolutely agree, Alka. Economics and perhaps a deep rooted knowledge of the Rule Books of the Field. All we can do is carry forth the mandate at home, that which we have provided AAP to carry out on our behalf at a larger level. AAp definitely is running on hope right now. Considering that we have some really educated, spirited and bright people joining in, we can hope for some change though. We're all waiting to see the result with baited breath. I agree, Kajal. They are making some of the best most respected names join the party. A good base which thinks for them, and a strong way to execute should help. Thanks for stopping by! 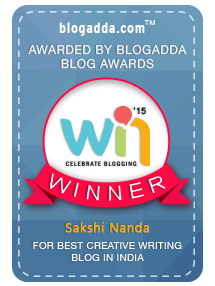 I am sorry for being the sole voice of dissent here Sakshi. I don't think AAP is demonstrating the integrity and sincerity they proclaimed as their platform before the elections. The few decisions they have taken show them to be weak in governance. And I am completely against the concept of freebies. They give me the jitters because while 'bleeding heart' politicians go about distributing free stuff, people like us have to put our back greater loads to produce the goods for them to distribute. Oh no, Dagny, you are not the voice of dissent here. Your doubts with AAP are mine too, and so many others'. My point remains - perhaps there was nothing to lose in this grim situation, by voting them in. Also, maybe it is just a little too early to see where this goes? My heart sank when I heard about increasing auto fares in Delhi, further doling out subsidies and forgetting that though I may belong to a different economic strata than the ones being catered to, I am as aam aadmi as aam aadmi gets. I read that. It is on their website too. Saw all the points, which were later reiterated in Kejriwal's speech. Im hoping for something here. If nothing comes out of this, no new party contesting elections can ever dream of doing it solely on the basis of money and liquor. AAP has already set a precedent that the people are not going to forget. AAP has done the unthinkable. They have exposed that the people of this country are well and truly fed up with the current political establishment and will just about go with anyone they perceive as promising change. But when it comes to the nitty gritties, I really hope AAP can pull up its socks. Governance is not done by emotions. And I am really against subsidies. But, I am really hoping against hope that they can deliver at least to some extent. Of course, the country has gone too far ahead on the road of corruption. It has seeped through our lives so much so that we consider it normal.It will be interesting to see how much change this nation is going to bring upon themselves. Else fighting the mafias that have taken over all possible fields is going to be no mean task. Yes, Rachna, AAP has done the unthinkable. And each passing public appearance I also shiver to see the lack of experience in words and deeds. And a surcharge of emotions, which you speak about too. Fingers crossed. Sakshi, I refuse to discuss politics or "politically correct" behaviour here. But I will say this, your post is brilliant as usual. Sakshi! I think that it's a brilliant post on Indian politics and delivery of goods in a huge state like Delhi. I may not be fan of AAP but what is heartening is that Indian politics is going though a transition phase setting pace for change which is a very good thing. I think one give the CM his chance and let him work in the interest of the people. If Kejriwal fails to deliver, he will be booted out of power. The good thing is that Delhites have shown there is a life beyond BJP, NaMo, Congress, Sonia/Rahul. Such change augurs well for change in a modern India spearheaded by the youth wanting change. Great post as you have perfectly assessed the mood of the nation. Im happy to see you accept this as a 'transition' phase, one which is changing the face of Indian polity and that too with our will and votes. I also love the practical approach you carry to this whole phenomenon. Yes, give him a chance or we boot him out. Simple. And thumbs up - Delhi has thought beyond the old and given. And that augurs well, I think. The rest, time will tell. Like Sid, I would rather not put down my 'political views' in writing anywhere for purely personal reasons, but that being said I loved the way you clearly brought out the fact that if not anything, AAP's victory has indeed rekindled our hopes for a better system of governance in the country. It has rekindled hopes, hopes that say we can think beyond the old and given and bring to power who we want to see working for us. Let us just hope our great expectations are realised too. Amen. Aah dear Sakshi plus ca change plus ca change pas. Life is an eternal wheel that goes round and round.....nothing is new and nothing is old.....I hope AAP can do something other than just rock the boat and shake us out of our lethargy. Good luck for the New Year and hope to continue reading your wonderful stuff! Best wishes for 2014 to you and yours too.